He defeated another Italian, Gianni Pitella, and will take over from Germany's Martin Schulz. The European Parliament has the power to block or amend EU laws, and will have the final say on whether to approve a Brexit deal with the UK. 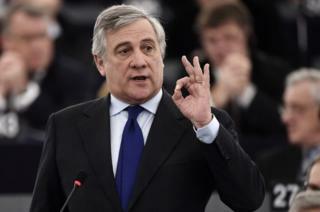 Mr Tajani secured 351 votes, against 282 for Mr Pittella, a socialist. The contest ran to the maximum four rounds. Mr Tajani's European People's Party (EPP) group benefited from a new coalition with the parliament's liberals, the ALDE, who hope to curb the influence of anti-EU populists. ALDE leader Guy Verhofstadt withdrew his candidacy at the last minute, paving the way for Mr Tajani's victory. The EPP candidate dedicated his win to those who died in August's earthquake in central Italy, and all victims of terror attacks. "We must devote our attention to all those who are in tough living conditions," he said in a short speech. The election of Mr Tajani puts the centre-right in charge of the three main EU institutions - the European Commission, Council and Parliament. The EPP is the biggest group in parliament, followed by the Socialists and Democrats (S&D) group which fielded Mr Pitella. The ALDE liberals are the fourth-largest group. Mr Pitella congratulated Mr Tajani in a statement, saying it had been a long time since the European Parliament had elected a president "in a fully transparent and open competition without any pre-arranged deals." He said the socialists would "constructively oppose" the "new conservative block". Martin Schulz is leaving the European Parliament to return to German national politics. The role of the president grew in significance during his tenure, and his successor will have to sign off the deal for Britain's EU departure - probably by late 2018 or early 2019. Mr Tajani has said of the task: "We need to be very balanced - we need to defend the rights of Europe, but we also have to think that in the future the UK will be an important partner for us."